In December 2017 our large renovation project began. 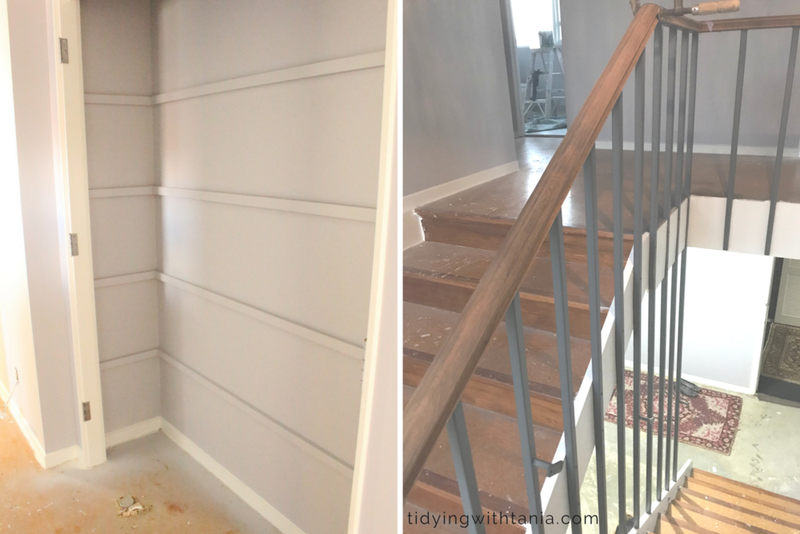 It was 5 years in the making and I was beyond excited, at the end of the project the entire upstairs of our home would be completely renovated. We were getting all new bathrooms (ensuite and guest bathroom), all the walls, ceilings, skirtings and windows painted, all new internal doors, painted, new double floor to ceiling wardrobe, new fittings and lighting, new curtains and blinds, new flooring and best of all a new kitchen, not just any kitchen, the kitchen of my dreams!! In November 17 I shared the renovations plans so it's time now to share the completed renovations. In this post I`ll take you through the kitchen renovations, sharing our journey and there will be lots of befores and afters.! As mentioned above the renovations were 5 years in the making. This is simple because we moved into the house 5 years ago and our goal was to renovate at the 5 year mark. This meant that we had plenty of time to work out what would be the best kitchen, or rather how a kitchen would work better in the existing space. We were fortunate that the existing kitchen and dinning space were all open and there was plenty of space to have a large kitchen. In fact the exisiting kitchen, albeit being old (as in it was installed in 1986), was actually a well designed kitchen and on the whole worked really well. In the end it was not difficult for Pete and I to come up with a layman's design of our new kitchen. We planned for the sink, fridge, pantry and oven to be in pretty much in the same position as in the old kitchen. The main difference with new layout was that we removed the L shaped bench and installed an island. By far in the biggest single cost in the renovation was going to be the Kitchen so we wanted to choose carefully who we were going to part our hard earned readies with. We decided to get quotes from three companies. We made it clear that we were getting quotes and meeting with each of the companies to help decide who would be the best to work with. It was an interesting experience. One company never returned my call, one pretty much came in and "told" us how we should have the kitchen, ignoring our own plans and thoughts. Which left us with the third company Kitchen Studio North Shore . Our first meeting was with one of their Designers, Natasha Wright. It was not a difficult to make a decision to go with them as Natasha really took the time to listen to us. She looked at our simple non designer plans and simply added to these with that designer touch. The key thing for both of us was that Natasha got to know us first , understand us and what we wanted and in the end we got the Kitchen we wanted. The other great thing with Natasha, she was very realistic with the full cost, in fact her estimate was pretty much on the mark with the final cost. The entire team at Kitchen Studio North Shore were great and delivered on time and on budget with excellent customer service. Before you get to have a new kitchen ...you have to destroy the old! The best and fun way to take you through the journey to the new Kitchen is with pictures. I will put in as many before pictures as I can for you, so you can get a sense of what it was like before and the transformation that has occurred. First up, the coffee station! This was on the top of the wish list for the new kitchen. Both Pete and I wanted to have this set up for Pete's little hobby or rather addiction!! For me I just wanted a separate sink that meant no more coffee grounds in the main sink and all over the bench top...soooooo sick of that. Pete visualising his new coffee station / coffee sink / final details for the plumber! And there it is, in all it's shiny coffee machine glory! Plumbed in, so endless supply of water. Moving on to the cooking area. Pretty much everything stayed in the same "location". And we got gas !!!! Pete and I love cooking with gas so it's been fabulous getting back on the gas hob!. I have to say for its age, the cook top and the oven were actually pretty good to use. And I sort of loved the retro look of the splash back. I was thinking of somehow incorporating it into the new kitchen, but the style was not right and it would be really hard to remove the tiles with out breaking them. The pantry design and layout took a bit of working out, but Natasha got it all sorted for us. The new pantry is a bench top and the doors are bi folds which means that you can fully open up the area. Lovely deep drawers and a massive corner Mondo corner unit. (all the details about the inside of the cabinets, set ups and organisation will be revealed in my Kitchen Organisation posts, coming up at the end of July and August). The kitchen area leads into the dining area, and it's all open plan. In the old kitchen, these spaces were separated by carpet and the L of the L-shaped kitchen. We wanted to make the kitchen and dining space feel more open and have ease of movement between the spaces so we now have a island parrellel to the kitchen sink and the same flooring all the way through. It has made a huge difference to how open and big the kitchen feels. Same view-post renovations - still hunting for new dining chairs! To be honest this was never going to be a cheap kitchen, so brace yourself!! the kitchen cost, excluding all appliances, tiling, plumbing and electrical was $45,000(NZ). The electrical, plumbing, painting, tiling was all part of the total renovation cost so I could not say what was specific to the kitchen. Additional costs were for the floor and wall tiles which ran at approximately $3k and the curtains $500. An unforeseen cost was the kitchen window which we had to replace as the original one was rotten. It had to be made by a local joinery company, it's not small so there was no change from $3k. Then you can`t forget the cost of the appliances. We actually brought the appliances a number of months before we started the renovations. Pete and I made the most of the annual Auckland Home Show and got the dishwasher, oven, hob, and rangehood for $6.4k, from The Jones Family Business, which I thought was pretty good. The fridge on the other hand....I love that fridge soooo much..however it was not the cheapest option...nor the smallest but it's what I wanted. And in this renovation Pete and I were both agreed that for once we would get want we actually wanted (within reason). I did managed to get a good price on it at $3.2k from the 100% Appliance store in Albany, their service was excellent and they delivered it for free. So yep it was by no means cheap!!! I do find it interesting the costs that get disclosed in the magazines for Kitchen renovations. I am sure that they do not include all the "hidden" costs that occur, especially in an older home. As much as I can I`ll provide the names and links to all the materials, equipment and appliances that we purchased. We have used Smeg appliances before and have always found them great and so far have not had any issues. The fridge is a total joy and having the filtered water is a real treat, never get sick of that. pete -slow cooking prep / "cooking with gas"
The only change which Pete and I have had to get use to is all the appliances are electronic now, so no more dials....so we have a had to get the instruction books out a few times for setting clocks, timers and working out settings!!! Needing to read instruction books is a frustration in Pete's book!! There were some struggles with both the bench top and the cabinet doors. Firstly with regards to the stone benchtop, I had chosen a more marbled looking stone, however the quote come in at $15k. So we had to rethink that option, that was just a bit rich for our blood. Natasha, the designer from Kitchen Studio was great at helping us, or rather me, to find something in our price range but that we would like. I was very nervous about what we chose as it was not what I pictured in my head, however Natasha reassured us that we had made the right choice. I now think that I love it more that my original choice, so am quietly pleased that it was too expensive. The other issue was with the cabinets. Both Pete and I wanted the shaker style cabinets and so these only come in Thermalwrap, which means that the colours are more limited and unlike the lacquered finish, can't be painted to our specifications. The challenge was finding the right cabinet colour, it had to be the right shade of bluey grey. The samples held were all brown grey and this was not going to work.......we could get the specific colour however it could not be in a shaker style cabinet.....dilemma cabinet style vs colour which to choose!!!! In the end Pete and I decided that we would not compromise on the cabinet style however maybe rethink the colour. However as luck would have it Natasha and I found a colour on the cabinet makers website, which at first didn't look right but once we got the sample it was the perfect colour. So in the end we got the cabinet fronts and colour we wanted. The day the tiler finished the subway tiles and the tile flooring was one of the best moments in the renovation, I could not believe how much they transformed the kitchen, took it from a construction zone to a completed zone!!! 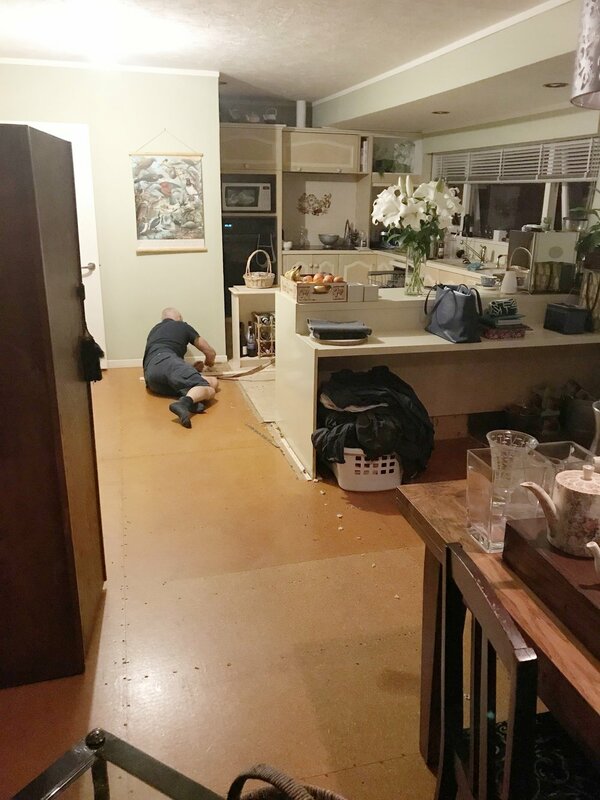 Both Pete and I found the kitchen renovation exciting, there were a few challenges along the way however nothing that was major or a game changer, deal breaker. In my previous post about our renovation experience I talk about tips to survive renovations. The number one is great communication. For the kitchen renovation we had to work with our builder and the kitchen company and our builder had to work directly with them as well, especially at the installation stage. Graham, our builder was doing all the electrical and plumbing and "build" part and Kitchen Studio were making the cabinets and bench top and installing. To get this to all come together successfully it was really critical to have great communication across everyone , and make sure you can be on site at the critical times, like the day(s) on installation. One thing that was very helpful from the Kitchen Studio was the explanation and details that you got on the "process". This meant that you had clarity of each step, who was doing what and by when and it was all documented. Any changes were updated and everyone got this information so there was never any confusion. I hope you found this interesting and helpful especially if you are renovating. As always I love to hear from you about any of your renovation experiences and tips. If you are after inspiration, just check out my Pinterest board where I have keep all my kitchen inspiration and other renovation ideas. Make sure you follow to see all the new pins and inspiration I send your way. Our renovation journey, update and tips to survive it! After just three months we are finally coming to the end of our renovation journey. I can't believe that it was back in November 2017 that I posted about our renovation plans. As everything comes together and the initial dream and planning all comes to life, you figure out if you have made the right decisions!!!! That's a bit scary and combined with the hustle and bustle on site to get the renovations over the line it's been a tiny bit stressful. You can see how renovation programmes make good TV....wow I`d be the ultimate drama Queen and everyone would be laughing at me...I'd be like... "I just can't deal with this anymore" followed by tears of course. So how far have we come in our journey? The end is in sight and there are only a few things in each area that need finishing off, probably a couple of weeks work left. While writing this post I reflected on how much the renovation process can be exhausting both physically and emotionally. On the whole I think that Pete and I have managed to survive intact through this big renovation project. So what were our survival tactics! Luck probably...but actually I think good communication was the most important, followed by good budget management by managing the variances and lastly learning to be patient! Yep so these would be my top three tips for survival. If you are the Kardashians and can't spell it would be Kommunication is King! Don't worry I have saved you from that pain. I know that the one thing that has really helped a lot has been great communication with the builder and other tradies that we are working with. Pete and I always made sure that we were accessible so if our builder had any questions, any decisions that need to be made that we could answer them and didn't hold him up. We also checked in daily to go through progress and any issues, always making sure that we delivered on what we promised we would do. There were a couple of times that I just couldn't get something sorted and told my builder and he would manage it for me. It really helped to be open and honest about what you can do and what help you need from them. We always made sure that everyone had the same message so there was no confusion...well we tried to! This was the biggest challenge for us, making sure that Pete and I agreed on the same thing, so if the builder asked me a question then Pete at a different time, that he got the same response. There were a few times where that didn't happen so it did cause some confusion. Like.."what do you want to do with the hand rails?" Pete says paint black...I say stain....painter is confused!!! Being on site as much as possible really helped, just literally being on call for the builder was a real bonus. It's all about the money honey!. As you go into a renovation project you have the contract agreed which states the cost and schedule of payments. Our builder was very specific with what was included in the contract, e.g down to the # of lights switches. So we knew exactly what we were getting for our money. In total these variances cost $6000 however we worked through each issue and decided on the importance and value to the renovation. A good example was the internal doors. We ended up replacing them all as they were all getting painted (part of the contract) however we did not want to paint doors that really were going to have to be replaced in a few years time (the laminate was peeling off a lot of them). Other things like replacing the hardware on the windows we didn't get done because they all worked ok and over time Pete and I can replace them with more modern looking ones. Changes occur constantly throughout the renovation, my advice is to just check if that change will actually mean a change to the contract, therefore a variance and what it will cost and agree or not on it. For those of you who know me well, may laugh at this...but yeah you have to be patience... or at least try to be patient. I think it's fair to say most of us, who aren't builders, have unrealistic ideas of how long it takes to get things done and what is actually involved. Seeing the detail of the work that has to be done helped me to understand that to do it right takes time and patience and sometimes rework. We had a situation with the pantry bench top which meant that there was delay and my builder had to reschedule his tradies. At the time I was not happy about it however it ended up being completed only being two days later than the original planned date.....really two days delay is nothing so I had to learn to cool my jets! My mind is now starting to switch into the excitement of decoration and furnishing.....now this will be a challenge as there is no budget left!! !